The SCCA and CASC Canadian American Challenge, known colloquially as CanAm, was an incredible piece of the 1960s American motorsport landscape. The series had essentially zero rules regulating how teams should build their cars. Crazy lightweight open-top jobs started showing up to compete with all manner of huge American V8s powering the rear wheels, and drivers just brave enough to hang on while the throttle pedal did most of the work. These machines were crazy in the mid-1960s when the series formed, but as time went on they got even wilder. Lola went a slightly different route for the 1968 season, sticking with the tried and true small-block Chevy engine tuned to not quite as much power as the big-blockers (670 horsepower), but making the whole car smaller and lighter—just over 1600 pounds. 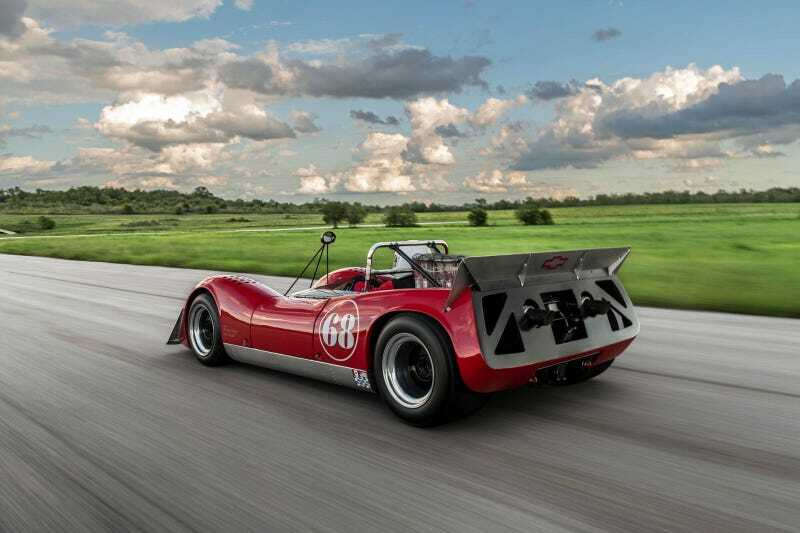 The Lola T-160 was a bit more nimble and not quite so hairy to drive. When the guys with big heavy engines roasted their rear tires, the Lola would shine. Across the 1968 season, a handful of T-160s took part, but could place no better than fourth a handful of times. Even by 1968 the CanAm season had gotten too professional for privateer Lolas to keep up. The McLarens dominated proceedings, whether McLaren themselves or privateers running McLarens. This particular Lola T-160 was entered never raced in CanAm, as it was purchased for James Garner’s fledgling AIR team, but it was decided they would run in F5000 instead. As a result, this is said to be the only Lola T-160 with an original chassis and original Lola bodywork. The car was crashed in 1978 at Willow Springs, but the last available set of replacement bodywork was sourced from Lola instead of building from scratch, and the chassis was professionally repaired at Dan Gurney’s AAR shop. The car has been treated to a number of updates, including a Halon fire suppression system, a cool suit system, and modern safety equipment. The brakes have been upgraded to a more modern AP Racing system. Veteran CanAm mechanic Ike Smith has stated the car to be “the best Lola T-160 anywhere” which carries with it a lot of weight. This car is still raced today, as it frequents vintage racing events on the West Coast with a current SVRA log book, as well as the Monterey and Sonoma historic events. Bidding is already up over the six-figure mark over on Bring A Trailer with four days left in the auction, but if you want something that can even be mentioned in the same breath as the CanAm McLaren M8B monsters, this is a good bet. Aside from the fact that it’s staggeringly quick, the simple and elegant shape of the T-160 is intoxicating. Cars like this were driven by the best racers in the world back then. Do you have what it takes to live up to their legacy? Only one way to find out.